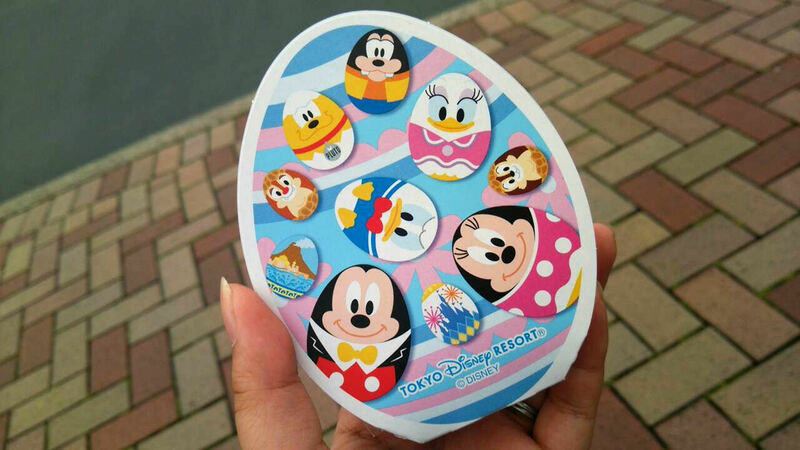 It’s been a month since Disney’s Easter started at Tokyo Disney Resort! Two more months to go and so much more yummy food to eat and egg hunts to do! Today I am going to eat and review the Macaron with Chocolate Ganache. Ever since I saw this in my Disney Fan magazine I knew that I would be trying it. I’m actually a bit picky about macarons and crazily enough I don’t really like ones that are powerful on the almond essence. Isn’t it just too adorable? The packaging and the macaron itself are both super cute. I wish they would have made a Donald version! That would have made my day! I really appreciate that they sell you the macaron in a little plastic bag. I’m sure it’s to keep it fresh until they sell it, but it also gives you the option to tuck it into your bag for a treat at a later time. Though, I wouldn’t suggest holding on to it for too long as it could get crushed and wouldn’t be as yummy. They were selling these at all three event booths in the hub in front of the castle. You can also pick up this sweet treat at Sweetheart Cafe. That would be for Disneyland by the way. At DisneySea you can pick this up at Mamma Biscotti’s Bakery and the American Waterfront Food Wagon. I felt like 380 yen was a bit expensive for such a tiny macaron, but hey, macarons are hard to make…for me anyway. …Probably not for whatever company OLC hires to mass create them. Here it is! 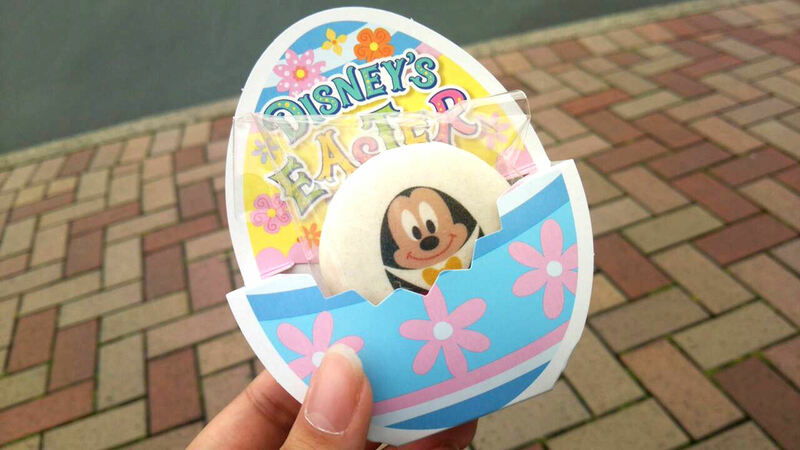 An adorably cute Mickey Mouse Easter egg is printed onto the front of the macaron. I didn’t notice when I ate it, but it looks like it’s a little bit off center, but that is not a problem at all! Sorry for the messy bite, but here’s what the inside looks like. There is a healthy amount of the chocolate ganache inside the macaron and it was absolutely heavenly. It was very light, but still chewy at the same time. It was actually chewier than I expected it would be. If they weren’t so pricey I’d buy 10 and scarf them down. Just for those of you who are curious, here’s the packaging without the macaron. I think it’s super cute, but I dunno what I could use it for. Maybe stuff one of the small Tsum Tsums inside? Hmm…might be a tight squeeze. Aaaand, here is the back side. I will give this macaron two thumbs up because it was delicious and the packaging was super cute. I do wish it was a bit cheaper, but it’s Disney so I can’t really complain. If you like sweets at all I would suggest you stop by one of the booths or bakeries at TDR during the Easter season and try one of these! the macaron looks soooo good! Looks so yummy and I love the packaging too. The gummy candy has such cute cases too, from the menu anyway haha. I love all their Spring stuff. The gummy cases are adorable! They have ones that are miniature versions of the character popcorn buckets too! I’ll try to get the Donald one next time I go :D Maybe I can snap a picture of the others!